What we are hearing is that US Secretary of State John Kerry has presented both parties with an interim agreement to “serve as a framework for continued negotiations towards a permanent agreement”. The “final status agreement” would be “based on the 1967 borders”. Concrete concessions with profound implications are being demanded of the Palestinians, but not so for Israel, which is “negotiating” on territory, rights, and resources that already belong to Palestinians. The details of the agreement, we are told, “are being worked out between the parties”. But here are some certainties: Palestinian self-determination will not be realised from this agreement. A viable Palestinian state with a contiguous land mass will remain impossible given the physical alterations of the landscape Israel has made through rapacious land theft, colonisation, and “Judaisation” of Jerusalem and large parts of the West Bank. 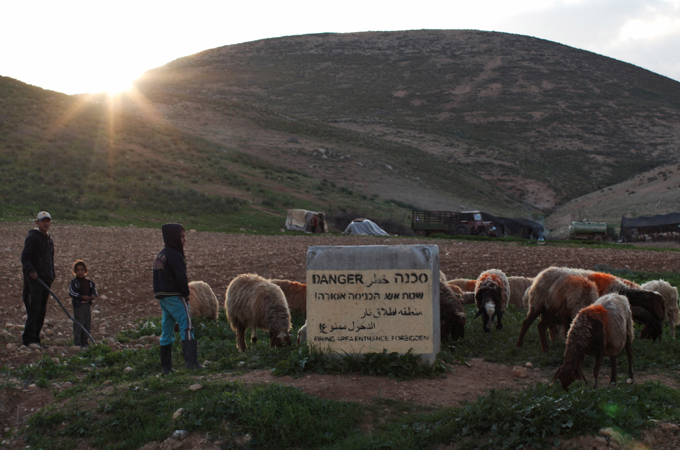 Israel will not cease illegal settlement construction, even if it does so temporarily. Palestinians will not have control over their airspace, natural resources (eg water, newly-discovered oil), borders or economy. Segregated roads, housing, and buses will still be a reality. The incentives being offered to Palestinians in the current talks are so insignificant, suggesting that the Palestinian Authority (PA) will accept funding over freedom. There is talk of an “unprecedented economic package”, and other “concessions”, all of which amount to temporary anaesthetics. On the other hand, Israel will likely walk away with Palestinian blessing for their theft of the Jordan Valley, the most fertile land in the West Bank, and continued control of Palestinian lives and resources. There is also talk that they might achieve a boost to their racist demographic goals – touted by Foreign Minister Avigdor Lieberman and Henry Kissinger, a WINEP adviser – by transferring large proportions of their undesirable non-Jewish citizenry to Palestinian control. But that’s gravy. Their immediate aims are two-fold: To deal a heavy blow to the growing Palestinian solidarity and boycott of Israel; and to finally gain legitimacy as a racist state. Israel is panicking, and rightfully so, because its power lies only in the realm of government and corporate elites. Israel has no defences against mass mobilisation calling for justice and basic human rights. This was precisely the case in the late 1980s, when the first intifada captured the popular imagination of the world. Even before mass communication and instant information, the images of Palestinian children with rocks facing heavily armed soldiers and tanks began to sear into international consciousness, threatening Israel’s image as the victim despite their best public relations and hasbara campaigns. Thus, Israel, in concert with the US, orchestrated the Madrid Conference, followed by the Oslo Accords. Although Palestinians made the painful sacrifice of relinquishing claim to 78 percent of Historic Palestine, agreeing to establish a state on a mere 22 percent of our homeland, Israel continued to act in bad faith, escalating the colonial and ethnic cleansing projects to create “fact on the ground” that currently preclude any meaningful realisation of a Palestinian state as envisioned by the Oslo Accords. Not only did the Oslo “diplomacy” consolidate the land Israel took through terror and war in 1948 and create a new baseline from which to expand Israel’s settlement endeavours, it also effectively siphoned the only real power we had – popular mobilisation – and broke our collective back by giving us false hope that liberation was around the corner. In return, we got an illusion of self-rule – a contingency of elected-for-life “leaders” who helped turn our proud people into a nation of beggars, dependent on international aid for sustenance. We saw further colonisation of our lands, which are now Jewish-only domains. And we got a well-trained Palestinian police force that, far from protecting Palestinians, collaborates with Israel to suppress legitimate resistance against tyranny. We are now in a similar place to where we were in the late 1980s. After years of struggle, organising and activism, Palestinian resistance has once again captured popular imaginations and civil society around the world – academics, activists, clergy, intellectuals, artists, trade unions, universities, municipalities, churches, and other individuals and institutions of conscience – are mobilising in solidarity with Palestinian aspirations for basic human rights and to hold Israel accountable for its unrelenting systematic crimes against the indigenous Palestinian population. And so, the stakes now are far greater. Curtailing the expansion of BDS might actually end up being a sweet aside. The real prize for the supremacist and imperialist ideology of Zionism is Palestinian recognition of Israel as a Jewish State. Many ask why is this such an important goal for Israel. The answer is simple. When the true heirs of the land, those who are native in every sense – historically, culturally, legally, genetically – recognise Israel as a Jewish state, they are effectively giving away their claims to their own homeland. Like a home owner who officially relinquishes her home to a squatter, Palestinians would give Israel the only real legitimacy it can ever hope to have. Making such a declaration is tantamount not only to renouncing our Right of Return to a land we just sanctified as belonging to world Jewry, but it would also mean abandonment of our Palestinian brothers and sisters who hold Israeli citizenship to permanent second-class status and institutional racist inequality. Continued bilateral negotiations in the current gross imbalance of power will destroy us. In the words of Richard Falk, “Intergovernmental diplomacy is not a pathway to a just peace, but rather a sinkhole for Palestinian rights.” One can forgive the PLO for being hoodwinked by Oslo the first time (despite warnings from luminaries like Edward Said). But to lead us into the same trap with the same language and empty promises is unconscionable. At this point, any interim agreement that does not fully end Israeli occupation, end Israeli apartheid (including full equality for Palestinians with Israeli citizenship), and repatriate Palestinian refugees should be viewed as an act of high treason against the Palestinian people.